The lowest temperatures of the season arrived in South Florida Wednesday morning as thermometers dropped all the way into the upper 30s and lower 40s. A Wind Chill Advisory had been in effect for Broward and Miami-Dade residents until 9 a.m., as well as a Freeze Warning for inland locations where the coldest temperatures have developed. At Butterfly World in Coconut Creek, up to 10,000 butterflies were moved indoors and then back outdoors as the temperatures got warmer as the day went on. The 50 humming birds at the facility love the cold weather and were more active than usual. 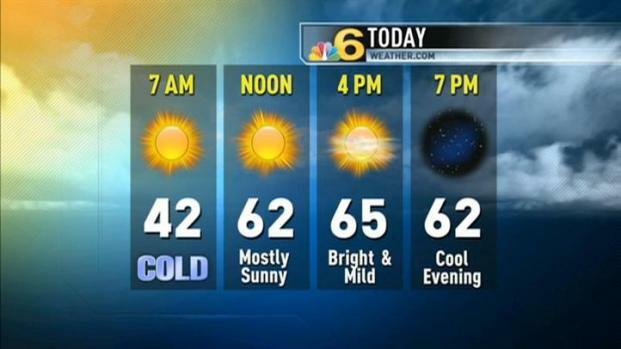 It will feel more like the mid and upper 30s due to the breeze but by noon it was expected to warm into the lower 60s. Afternoon highs will peak in the mid 60s. Mostly sunny skies will continue. Winds will be much lighter than Tuesday and range from 5 to 15 mph. Tourist Manfred Rott, from Munich, Germany, who was at Butterfuly World said the weather was beautiful. Temperatures are expected to rise into the upper 60s and lower 70s Thursday.